Home Art Seek and will you find? Long school holidays may be welcome but inevitably parents are sure to hear those dreaded words, “I’m bored”. However, HELEN PERRY has discovered a new book, designed by a young Aucklander, which should keep curious children happy for a couple of hours at least! Spy with my little eye something beginning with A, and B, C too and, of course, D. In fact, with every turn of the page in Jenna Brockett’s new book, A, B, Seek, the idea is to detect all sorts of animals and objects lurking in a black and white network of leaves. 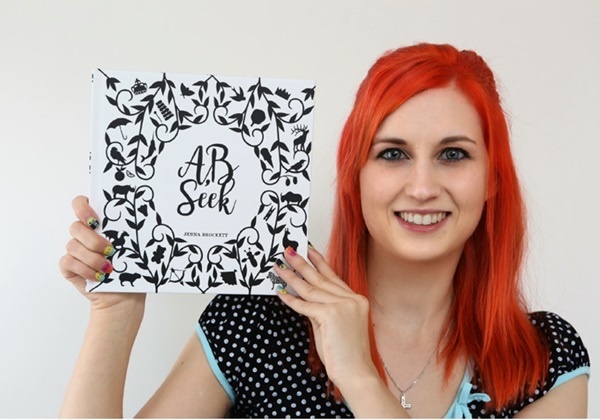 All the original pictures for A, B, Seek were hand drawn with each letter taking Jenna about 20 hours to plan, design, sketch and draw. With more than 1000 images to find hiding amongst the 26 letters, this book offers hours of fun especially when some quiet time, away from technology or vigorous play, is called for. What’s more, the book can be explored two ways – by looking at the word list then finding the corresponding items in the picture or by studying the picture and writing down as many hidden objects as possible before comparing them to the list. Aimed primarily at children aged two to 12 years, nevertheless many people have added the book to gift parcels for newborns, recognising that the black and white images provide early interest and stimulation for babies. With a bent for art, and crafts too, which showed up at an early age, Jenna pursued art at school then followed a career in graphic design.